DASpedia | What is DAS ? DAS is an acronym which stands for Distributed Antenna System. The term DAS has been around since the mid-1980s and is typical jargon used among wireless professionals over the last few years. DAS is a system used to distribute wireless signals throughout a defined area, for example a mall (indoor or out). DAS can be simply understood by examining how wireless carriers (Verizon, AT&T, etc.) provide coverage for their customers. Since the introduction of cellular technology, carriers have relied on outdoor antennas commonly known as cellular towers or macrocells, to distribute their signals. However, it soon became apparent this method had its shortcomings. Gradually cellular phones transformed from being an expensive accessory for the few who could afford them to a widespread daily utility, reaching saturation levels in the mid-1990s. Wireless carriers began realizing the importance of indoor coverage, but not much was done on a large scale until the early 2000s. Do you remember the days of having to step outside to ensure cellular reception? Thankfully those awful days are mostly behind us. Today 70 to 80% of cellular communication either originates or ends indoors and there are thousands of professionals working tirelessly behind the scene to make sure consumers receive seamless service. Have you ever wondered how your cellular phone receives and sends its signal inside a crowded venue like a closed dome stadium or underground train station? Imagine being one of 80,000 spectators at a professional football game. Almost every person next to you is using some sort of wireless device and those devices are constantly in communication with their respective wireless carriers in the form of RF (Radio Frequency) signals. Even if they’re not being used, devices remain in communication mode. Supporting all these users is a massive behind-the-scene undertaking, requiring large amounts of equipment, man-hours and capital, but enabling that call to the babysitter to make sure Jr. isn’t tearing the house down or posting those selfies to Facebook. DAS is an infrastructure which makes these wireless activities possible. It consists of equipment and components designed to be a neutral gateway between wireless subscribers and carriers. In this case, “neutral” means the system doesn’t discriminate between wireless carriers or frequencies. It handles them all. 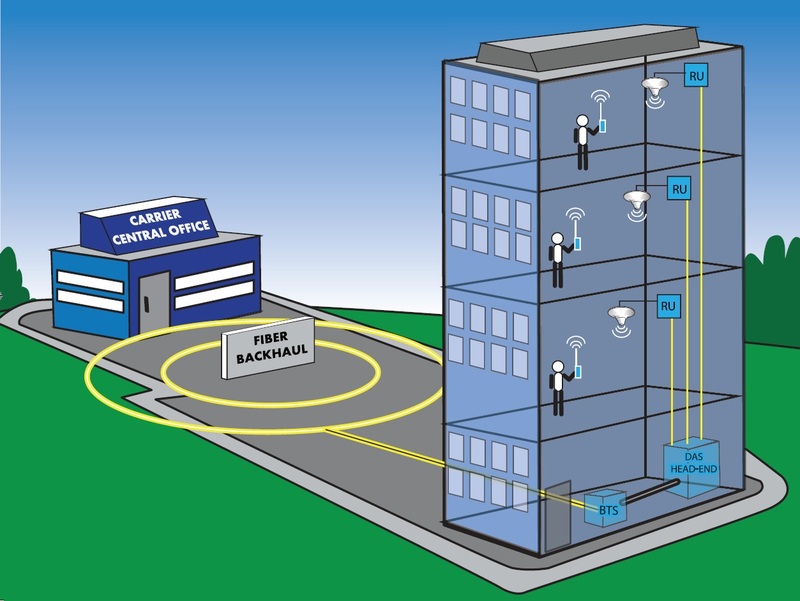 Although it sounds unintuitive, wireless carriers in the US actually distribute our communications using a physical network called backhaul (see Figure 1), which is a fiber optic network ring that connects wireless carriers’ central offices with their remote hubs, whether they be a cell tower or a base transceiver station (BTS). BTS are manufactured by telecommunication giants such as Alcatel-Lucent, Ericsson and Nokia-Siemens. Everything is digital at this stage. All our phone conversations, text messages, emails and selfies are transported in bunches of 0’s and 1’s between carriers’ central offices and the BTS. This is efficient because wireless carriers can move massive amounts of data quickly with almost no delay or signal degradation using fiber optic cables. This means you won’t find a big antenna sitting on Verizon’s HQ office that talks to every cell tower in the nation. These fiber optic networks do the same job and are invisible to our day-to-day lives. Most fiber rings are laid underground but some run using existing telephone poles, however they are almost indistinguishable from other lines. Digital signals are converted into analog form (think radio waves) before entering buildings or distribution via cell towers. In other words, wireless carriers use BTS to convert digital signals into analog RF form so it can be propagated throughout given areas or buildings. These areas are where DAS reside. Current technology permits DAS integrators to take high power analog RF signals from carriers’ base stations and distribute them as they see professionally fit. Everybody wins if the job is done correctly. Consumers enjoy their smartphones by posting constant updates to their social media sites, carriers get to bill everybody for their data usage, venue owners generate extra rent income for safekeeping carriers’ equipment, DAS vendors get to sell more equipment, and integrators are paid by carriers for installing DAS systems. But if a DAS installation is botched, the fingers begin pointing in all directions. Usually, multiple parties are involved in installing a DAS system in a large venue and its one big hate fest that rivals the most animated reality TV show if things don’t go as planned. Now let’s talk about data. Do you remember the days when you monitored your family’s cellular plan so your teenage daughter didn’t exceed her allocated minutes? Of course she ended up exceeding the minutes and you had to sign up for unlimited minutes. In addition, the 5,000 text messages in your basic plan weren’t enough for her, so you had to pony up for unlimited-text-service for the entire family. As great as those days were, it was just the beginning of our appetite for communication bandwidth. Now it’s all about data plans. It got worse with the introduction of smartphones. Those little smart-monsters have an insatiable thirst for data. Technologies such as 3G and LTE are major driving forces behind your smartphone and DAS evolution in the US – LTE more so than 3G. For our purposes, it is only necessary to know that 3G and LTE are technologies that make networks faster. The madness all began with the introduction of PALM Pilots. PALM Pilots weren’t wireless devices, but people got used to organizing and planning with their smart devices. Few anticipated these paradigm altering devices would be obsolete within a few years of their introduction. We were just learning to master characters on those darn things! Blackberries were on the march and brought the real trouble. Suddenly everyone was checking their email, texting, and even had limited access to the blossoming internet. Blackberry by RIM created a lot of buzz among professionals until Apple and Samsung introduced their respective game changing devices. Wireless carriers such as AT&T were very much enjoying the game until their customers started demanding better coverage and faster download speeds. After all, watching a standard definition 3 minute Youtube video on your mobile device consumes the same amount of data as sending more than 3000 email messages without attachments. Suddenly, streaming was it and wireless carriers had to scramble again. Verizon was the first carrier out of the gate with true nationwide LTE coverage and their DAS infrastructure cost a pretty penny to build. Wireless handsets have become prevalent and many consumers are fully dependent on them. Some feel they need to use their smartphones at all times to function properly. Yes, even while driving 65-mph down the freeway. GPS navigation, communication-via-voice, text and emails, entertainment and even our social life is packaged into a single device that fits into your pocket. But average wireless users don’t have the slightest idea how everything works. Most mobile users know where to download the latest version of their favorite apps, but don’t have a clue as to how US wireless infrastructure evolved to support their wireless habit. “How many bars do you have?” and “Can you hear me now?” are common phrases among wireless consumers. But maybe that’s how everything should be. Not all of us know how our gas or electricity gets delivered to our houses. So who are we to climb on our high-horses and make condescending judgments toward wireless consumers? We’re just as bad. DAS is the answer to everything. It fills the coverage gap and capacity shortages. Carriers love it because DAS enables them to drive revenue and boast about their coverage maps (showing them on nearly every other commercial during the evening news.) Cellular bills keep climbing and handsets get more expensive. Industry is happy because everybody makes money. The good news is there is plenty to go around for years to come. The wireless industry, especially DAS, is the biggest wave of technology growth the US has experienced since the inception of the internet and dot-com bubble of 2000. Nobody knows this outside those involved in wireless and DAS. Our industry was completely immune to the latest financial turmoil and Great Recession, posting hockey-stick growth patterns while most industries languished. DAS infrastructure fueled this growth and at the center of it all are a bunch of pimply faced teenagers who love to stream videos on their handsets and share their selfies with the entire world. Most importantly, their parents always pay the cellular bill on time. Nobody wants an irritable teenager after all.